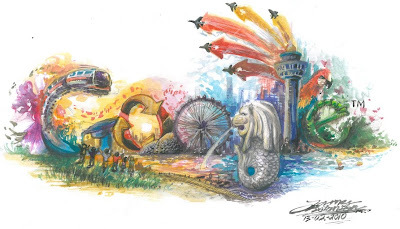 I'm sure everyone knows that Singapore will be celebrating its 45th birthday on Monday and to coincide with this important date, the talented young artist, James Rotanson, will have his winning Doodle 4 Goggle displayed on Google Singapore's homepage http://www.google.com.sg/ for 24 hours. James' winning Doodle, titled 'Colours of Singapore' was hand-picked by original Google Doodler Dennis Hwang from over 30,000 doodles in the competition in January. There were many beautiful and creative interpretations of the Google logo entered by school children all over Singapore, some as young as four. James' entry is an energetic, colourful and inspiring sketch, so do look out for James' doodle on Monday and support our local young talent. Have a great National Day!